I’ve been playing angry birds for quite some time now and I felt bored and angry when things don’t go the way I want them to be. 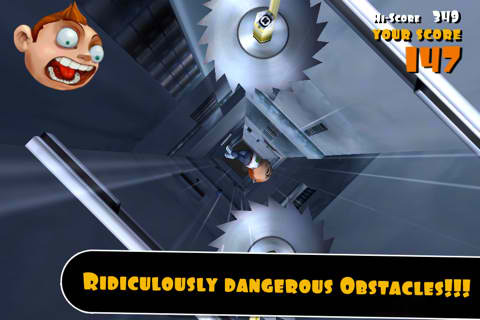 So I tried searching for other games, the ones that let me feel I’m falling, and I found one that’s a best fit for the category–Falling Fred iPhone Game. Well, in the Appstore, it says this iPhone game contains violence and gore galore and it is just right. What makes this game a good one (at least for me) is that you have a choice in your hand on how you want to fall; you can fall hard fast or fall softer slowly. The point is, this iPhone game rocks but I also have some suggestions to make. 1. Perceptive and Wise Physics – since the game involves falling, in fact it is falling most of the times, one of the things which is very important is physics. In every fall, hard or soft, there should always be an equal property of damage. In other words, if your character falls so hard, the body should be like a mashed potato when hitting any object. Otherwise, there would not be much damage to it. Falling Fred is just perfect when it comes to this aspect. 2. Intuitive Calibration – what I mean is that accuracy is present in every movement and angle. I can say that the developer may have dedicated some time making this aspect accurate enough. 3. Very Challenging – the game-plays are very challenging and advanced stages are more difficult than earlier ones. This game really makes an appeal to me because of challenges I experience on every stage. 1. Not Child-Friendly – one of the setbacks of Falling Fred is that it is limited to adult audiences only. No parents should allow their children to play this game. It really contains scenes not suitable for younger age especially that it is easier to fall whenever you are on higher floors; that’s what we don’t want our children to do. 2. Variation is Very Limited – I mentioned earlier that Falling Fred is very challenging in a sense that you have to control your character not to hit obstacles ahead, but that’s all to it. You fall, evade obstacles and in the end you still hit the floor. But that’s the nature of the game, isn’t it? 3. Memory Leak Issue – the longer you play, you will experience some lag times. You just have to restart the app to regain the smoothness. But I believe no one would like to spend 3 hours of playing this game straight. Seller: Dedalord S.R.L.© Dedalord S.R.L. Falling Fred iPhone Game is generally good to kill some time. But you must know that others may find some funny looks from while playing this game so it would be better if you play this alone.